Riley Lee began playing the shakuhachi (bamboo flute) in Japan in 1971, studying with Chikuho Sakai until 1980, and has been a student of Katsuya Yokoyama since 1984. He was given the rank of Dai Shihan (grand master) in 1980. Riley was born in Plainview Texas USA in 1951, and moved to Shawnee Oklahoma USA in 1957, where, aged 13, he became the bass player of the award winning rock band "The Workouts". He and his family moved to Hawai'i in 1966. He first went to Japan in 1970, and returned in 1971, when he began his shakuhachi studies. He lived there continuously until 1977. Riley was born in Plainview Texas USA in 1951, and moved to Shawnee Oklahoma USA in 1957, where, aged 13, he became the bass player of the award winning rock band "The Workouts". He and his family moved to Hawai'i in 1966. He first went to Japan in 1970, and returned in 1971, when he began his shakuhachi studies. He lived there continuously until 1977. 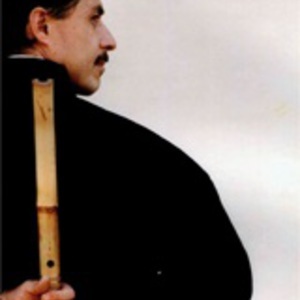 From 1973, Riley toured internationally as a full-time performer of taiko (Japanese festival drums), yokobue (a high pitched bamboo transverse flute) and shakuhachi with Ondekoza (now called Kodo) a troupe of traditional Japanese musicians, performing with such groups as the Boston Symphony Orchestra, and at venues such as Kennedy Center (Washington DC), Roundhouse Theatre (London), Espace Pierre Cardin (Paris), and the Boston Symphony Hall. Riley completed his BA and MA degrees in music at the University of Hawai'i, and received his PhD degree in ethnomusicology from the University of Sydney. His PhD dissertation topic was on the Zen repertoire of the shakuhachi. He was an East-West Center grantee in 1985-1986 and a Japan Foundation fellow in 1988-1989. He was made Honourary Fellow of the University of Western Sydney in 1997. He has been instrumental in creating a professional presence of traditional Japanese music in Australia. He has introduced the shakuhachi to a diverse audience as both a soloist and with other performers of such instruments as harp, cello, saxophone, tabla, guitar, didjeridu, and symphony orchestra. He helped found the Australian Shakuhachi Society in 1996. His request in 1988 to the Sawai Koto School in Japan that a koto player be sent to Australia facilitated the immigration to Australia of talented Satsuki Odamura. In 1995, he also co-founded with Ian Cleworth, Australia's dynamic Japanese festival drum group, TaikOz. It has since become one of Australia's premier performance groups, acclaimed both at home and in Japan. He performed with the Sydney Dance Company in the 1999 Australian season of Graham Murphy's Air and Other Invisible Forces, touring USA at the end of 2000 and Europe in 2001 with this production. He has made over fifty commercially released recordings since 1980, which are sold worldwide on a number of labels. On January 1 2000, Riley was seen, with five other musicians, on an internationally televised programme, ushering in the new millennium on New Year's morning at dawn, from the top of the 'sails' of the majestic Sydney Opera House - an auspicious start for the next 1000 years for shakuhachi enthusiasts worldwide. Riley's studies with traditional teachers in Japan have included such peculiar methods as practicing barefoot in the snow, blowing into his flute under waterfalls and in blizzards until icicles form at its end, and running the Boston Marathon and then playing taiko drums at the finish line. Riley Lee is the Artistic Director and Chair of the Executive Committee of the World Shakuhachi Festival 2008, a four day event to be held in Sydney 4-8 July 2008, at the Sydney Conservatorium of Music and the City Recital Hall. The event will feature as many as thirty concerts, workshops, forums, seminars and other events. Seventy of the world's leading shakuhachi players will attend as invited performers, and as many as 400 shakuhachi enthusiasts will attend the Festival, making it the largest event ever in the history of the shakuhachi. Riley started teaching breathing workshops in the late 1980s, at the suggestion of one of his students, well-known Sydney acupuncturist Ross Penman. Riley has since refined and expanded his repertoire of exercises, gleaned from a number of sources and from his long and focused relationship with shakuhachi. The exercises are designed to create an awareness of one's breath while at the same time, improving the strength and control of the muscles used in breathing. His workshops last from one to six hours, and single sessions have been attended by as many as two thousand people. Riley's current understanding and practice of good breathing techniques is presented in his DVD, called "Breathe!". In 1976, while on tour in Europe with Ondekoza, Riley met Patricia, who was at that time living in Paris. Patricia returned with Riley to Sado Island, and they left the group in 1977, while on tour in the USA. They were married that year. Patricia is Riley's primary inspiration, and critic, and has worked full time as his manager / agent since 1992. After returning to Honolulu with Patricia in 1978, he began teaching privately and performing. He founded the Chikuho School of Shakuhachi of Hawaii. He was a lecturer of the shakuhachi at the University of Hawai'i until leaving for Australia in 1986 to take up a PhD fellowship at the University of Sydney. Patricia and Riley's twin daughters, Aiyana and Marieke, were born in 1979 in Kahuku, on the North Shore of Oahu. Riley lives with Patricia in beautiful Manly NSW Australia, facing both the Pacific Ocean and Sydney Harbour.